When a product takes the beauty industry by storm, many other brands will be sure to follow. So when Anastasia Beverly Hills introduced the Dipbrow Pomade ($18) in early 2014, other brands quickly followed suit. The drugstore, on the other hand, can be slow to take on the trends, but lately I feel as though Nyx Cosmetics has been uping their game. (Can we talk about their Spring 2016 releases really quickly?! Yes, Nyx! Yes!!!) They introduced their Tame & Frame Tinted Brow Pomade in early 2015, but I'm slow to jump on the bandwagon as I'm skeptical of practically everything new. 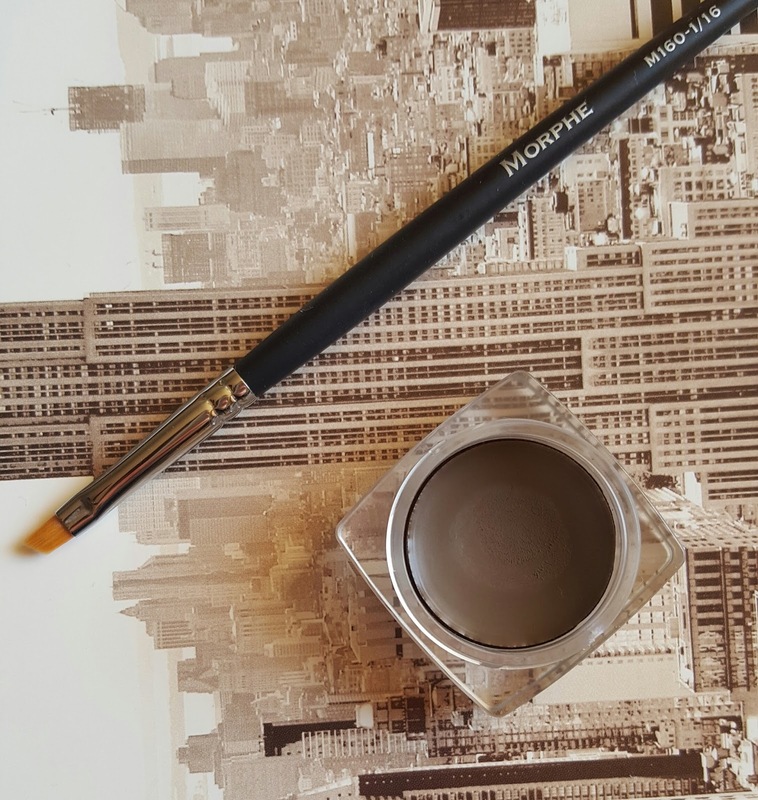 However, recently, my HG Nyx Micro Brow Pencil has provided really inconsistent results for me, sometimes giving me a fab brow, other times rubbing off or going patchy. I have a feeling this has a lot to do with the fact that it's Winter here in NYC, so I'll revisit that product again once the weather gets warmer. Nevertheless, my brow game must go on and remain strong, so off I was on the hunt for another brow product. I came across the Nyx Brow Pomade during one of Ulta's BOGO sales and decided that now was a good time as ever to try something new. I decided to go with the shade Brunette instead of my usual Taupe/Blonde because Blonde looked overly grey to me online. Brunette still maintains a cool undertone, but it's a quite a bit darker than Blonde and much more flattering on my skintone and with my natural hair color. 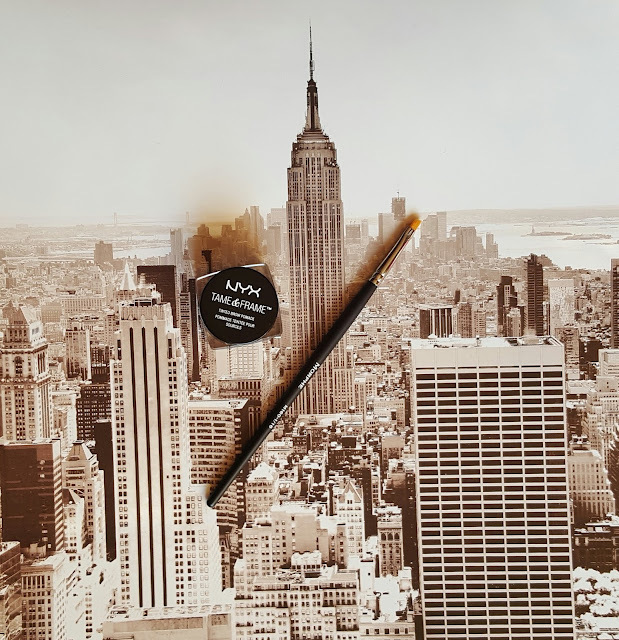 The Nyx Tame & Frame Tinted Brow Pomade is a gel/cream product that gives color, shape, and fills in your brows when used alongside an angled eyeliner brush of your choice. Nyx claims, "Give extra life to your brows with our easy-to-use brow pomade that glides onto skin and hair. Our smudge-proof waterproof formula comes in five shades to coax brows into prime shape. Stand up to humidity in style!" As mentioned before, this product must be applied with an angled eyeliner brush. However, the product does not come with it's own brush included. This is fine with me as usually brushes that come with products are throw-aways anyway. Personally, I've seen enough tutorials on the Anastasia Dipbrow Pomade to know that I should apply this Nyx product with a very thin angled eyeliner brush. Doing so will give you much more control when creating "hair-like strokes", thus allowing you to go as natural or as dramatic as you please. For a mini tutorial and my tips and tricks on how to apply this product, check out the pictorial located further down in this post. Using a brow product with a more creamy consistency on my oily skin is not at the top of my list. I expected it to move around on my skin and disappear by the end of the day. However, I have to say that I am pleasantly surprised. Swatching it on my arm, I found that the product has a fast dry-down time and sets to a powder finish. Rubbing the swatch, I had no transfer and found it was a bit difficult to remove. The oils naturally produced by the skin, of course, break down the product over time, but I found that it broke down "gracefully". Six hours into my wear test, I noticed that the product had oxidized and become slightly warmer, but nothing that was alarming. Ten hours into the wear test I noticed that the my brows didn't look as crisp and clean, but that problem was easily corrected by running a spoolee through my brows and spreading out the product again. I finally decided to remove the product at the twelve hour mark and I felt I had to go over them a few times with makeup remover and toner because my brows were still tinted. 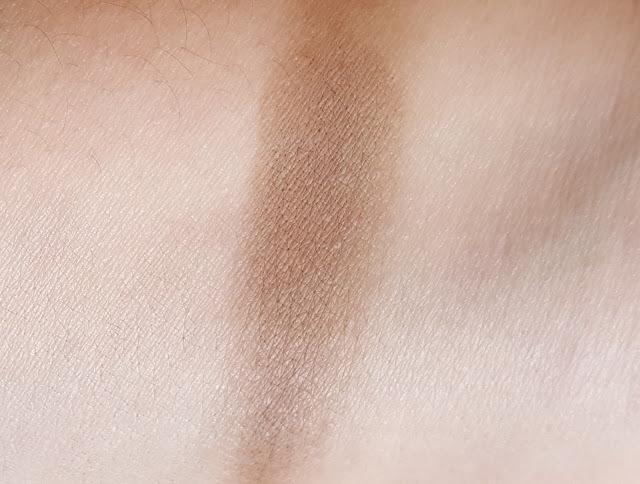 If you have extremely oily skin like I do during the Summer, I think this product could still work for you as long as you prime your brows with a long-wearing drier base like a Mac Paint Pot. While the container of the Nyx Tame & Frame is super tiny and travel friendly, it actually contains more product than its higher end counterpart. The Nyx Tame & Frame contains 0.18 oz. for $6.99, while the Anastasia Dipbrow only has 0.14 oz. for $18, making the Nyx pomade a much better value. In fact, Nyx is constantly on sale at places like Ulta, so you would be able to stock up without doing too much damage to your wallet. It should be noted, however, that, while they're both pomades, they have significantly different formulas. Dipbrow is very pigmented and much thicker in consistency and could potentially be harder for some to work with. On the other hand, Tame & Frame has a thinner formula that is more beginner friendly since it's harder to add "too much". I tried out this product because I needed to find something new to use in my brows and I think I found just that. I'm very pleased with how much control I have in creating my brow shape and how long this product wears. Overall, I'm extremely impressed, so you can be sure to see me using it in future Instagram looks and tutorials. 1♥ After grooming your eyebrows to your liking (and priming them if you have oilier skin), take a small amount of the Nyx Tame & Frame Tinted Brow Pomade on a thin angled brush and line the bottom of your eyebrow. Leave the very front of the brow unlined as it will be defined later. 2♥ Take a small amount of the pomade again and line top of the brow, creating the arch to your liking. Also, leave the front blank. 3♥ Fill in the area between those two lines. If there still seems to be some areas that are blank, don't worry. That will be corrected in the next step. 4♥ Using whatever product is left on the brush, line the top and bottom of your brows now. The reason I waited to define the front of my brows until now is because less product used in the front creates a softer effect. Then, taking a spoolee, brush through your brows. This blends and spreads out the product a bit, filling in the front and any sparse areas you might have left out in the last step. 5♥ Put on your finishing touches. 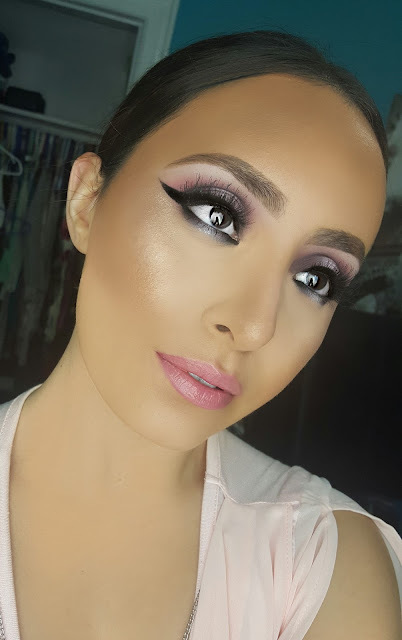 Personally, I like to carve out my brows, so I use my foundation to carve out the top and my highlighting concealer to carve out the bottom, both in conjunction with a flat liner brush. If you do this, blend it out really well. You don't want there to be a halo directly around your eyebrows.